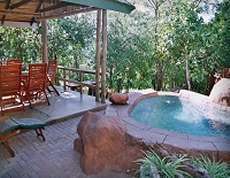 At Tranquil Nest each chalet is nestled amongst indigenous trees, home to a wide variety of birds, overlooking The Sabie River Valley which lies at the edge of the escarpment of the misty Drakensberg Mountains. Various animals frequent the property including Zebra, Impala, Kudu and Wildebeest to name a few. 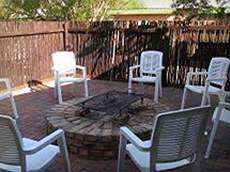 Services and facilties include: Air conditioners, Generator Backup electricity for whole lodge on standby, DSTV, Safe facilities, Secure parking, Picnic Baskets by arrangement, Serviced daily, Laundry service available, Bird watching, Private Jacuzzi or Pool and Braai facilities. No pets allowed and no smoking in units. 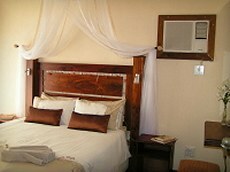 Tranquil Nests' 5-Star Honeymoon Suite was designed to create an atmosphere of comfortable, romantic, luxury. The queen size four-poster bed, crisp white percale linen, comfy chairs, double shower and built in Jacuzzi all cater to your sensual needs. 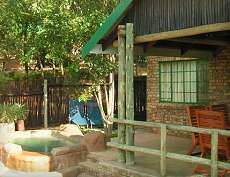 The chalet is fully equipped, and also have barbeque facilities, air-conditioning, and DSTV. 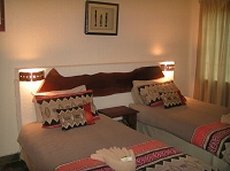 The double storey A-frame home offers budget accommodation (ungraded star rating) for 8 adults and 4 children. 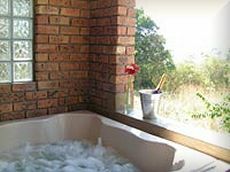 Four bedrooms, 2 bathrooms, double lounge, TV DSTV, dining room, large kitchen with breakfast nook , braai and outdoor living facilities as well as private pool. 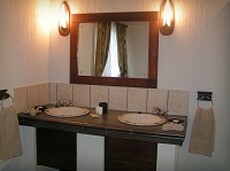 Both bathrooms have a shower, basin, toilet and bidet. A baby bath is also available upon request. Kitchen fully equipped and serviced daily. 5-Star graded Caravan Park with private ablutions and scullery also available. Located ? ?km from hazyview on the R40 towards White River.